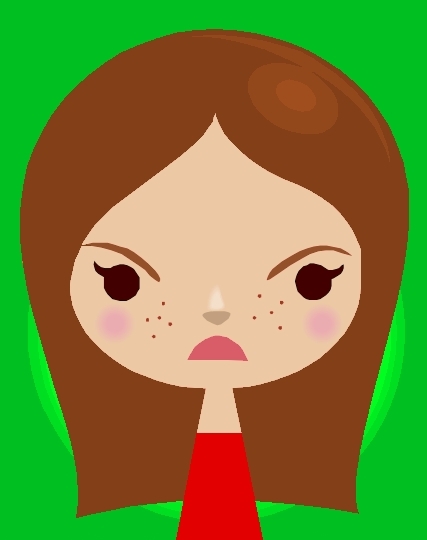 That's me, Little Miss Grumpy. It's official. Hepatitis C treatment has turned me into Little Miss Grumpy and today she needs to vent. Here is the thing: I knew going into this that I could have all sorts of side-effects from treatment. I also knew that it could potentially make my other chronic conditions temporarily worse. But this was a calculated decision. I was willing to endure a short-term increase in my medical problems to gain a long-term reprieve from chronic Hepatitis C infection, the only chronic condition I have that could potentially be cured. I just thought I would be getting more help managing the medical problems that emerged during and after treatment. My recent experience has taught me that this isn't what happens when you go through Hepatitis C treatment at UCLA. Every appointment I'd go in with a list of side-effect and all I got back was blank stares. So I asked for help directly and I still didn't get it. The message I got over and over was my "unusual" side-effects or the impact of treatment on my pre-existing conditions wasn't my hepatology team's problem. Even the side-effects that were clearly related to my Hep C treatment, like needing a blood transfusion because of ribavirin-related anemia, were treated like "action items" to be delegated to one of my other doctors. So I had to go looking for help elsewhere. But since all my other doctors were looking to the hepatology team to "manage" my response to Hepatitis C treatment, they responded with uncertainty and hesitancy when I came to them asking for the help I wasn't getting. So I went looking for new doctors, mostly specialists, to address my specific needs. Case in point: I have two skin infections and one gastrointestinal issue that emerged during treatment that continue to cause me problems. I've identified and dragged myself to different specialists. Now the treatment plans for these conditions are conflicting with each other. Plus I know they also will make some of my other conditions worse. Add to that the absence of a medical professional willing to coordinate my care and prioritize these issues with me. Yup, I don't have, but desperately need, a substitute quarterback for my medical team. I'm just too sick to keep calling all the shots and making all the plays. Don't even get me started about how much pain and suffering all these issues are causing me. Or how much of my energy I have needed to divert from resting and recovering from treatment to making new medical appointments, starting new medications and managing my burgeoning medical care. Strangely enough, what really bugs me the most is that I might have given one of my skin infections to my dog Theodor. Or maybe he gave it to me while I was immune suppressed during treatment. Either way, it breaks my heart to think he is suffering too and I might have caused it! He's got to go to the vet now, and you know what that means...more precious time, energy and money expended. I joked with my hubby that the vet will probably figure out what Theodor has and start treating it before my medical doctors figure out what is going on with me. Maybe I should have the vet look at my skin instead. The thing is, 24 years ago when I underwent chemotherapy for leukemia, I had a team who really took care of me, both in and out of the hospital. Silly me, I assumed I'd have a similar experience with Hepatitis C treatment. After all, with a nurse who said I could call 24/7 if I had problems and a team consisting of a doctor, nurse, nurse practitioner and administrative assistant, the hepatology team appeared able to meet my needs. Clearly cancer treatment and Hepatitis C treatment are two entirely different things, like comparing apples and lemons. The most important difference: feeling supported by my oncology team versus being labeled as a "difficult patient" by my hepatology team. As someone who has now gone through both treatments, I think oncology has a lot to teach hepatology about how to care for patients. Unfortunately, it seems that hepatology at UCLA is not interested in learning how to do Hepatitis C treatment better. According to a hepatologist I recently consulted there, the long-term goal is to delegate Hep C treatment to primary care physicians once an antiviral cocktail with fewer side is FDA approved. He thought this would be happening in the next 2 to 3 years. Isn't that nice. And doesn't that speak volumes about how some hepatologists view patients living with Hepatitis C? You know, I hate to say this, but sometimes having a great patient care experience raises our expectations for our future medical care too high. Plus great care makes it so much more obvious when we get poor care. And what patient wants to get or put up with poor medical care? But then again, not every doctor can be the best, the brightest and the top of their class, can they? Even the Hippocratic Oath doesn't guarantee that every doctor will be committed to good, solid and reliable patient care, not all or even most of the time. Will I get through this current dilemma? Yes, of course. When will that happen? I don't know that just yet. I'm taking it one step at at time and right now I am still busy trying to get appropriate and timely care for my current medical needs. Until I get what I need, including more rest and relaxation time, I'm afraid Little Miss Grumpy is here to stay--but just for now. I wonder if bribing her with treats or letting her stay up late watching movies through Netflix will help her chill out? Couldn't hurt to try, right? I think expecting them to help manage your side effects should be a given. The bums! Sounds like you have every reason to be grumpy. HOpe you start to feel better and can find a better team for the future. I"m so sorry you're going through this; I've been there with other dr.s in the past; I feel like I'm running the show & they've lost interest. I don't know anything about their hepatology department, but I have had great experiences with the dr.s at USC (Neuro, Pain clinc, etc.). I hope you can find a better set of dr.s to help you! Selena I really get it. I was sick with& after treatment & still have not gotten well enough for another treatment, because of ongoing side effects debilitatng me. I finished treatmenf Feb 2011. I have had the exact problems., no one cares! Know why? It is called HEP c ( leperacy) not Cancer or leukemia ! You can be Little Miss Crabby as long as you want! Hi there, I went through a similar tx for Hepatitis C. I had a "specialist" who's only interest in me was getting me on his trial. When I had side effects he told me to go to my primary doctor. She did not understand why it was up to her to treat SX that the "specialist" was giving me. I did not understand either and I was was so sick all I could do was cry. It sounds like they are going to make tx of Hepatitis C an orphan. It is disgusting to me. The only good thing I can say is that I made it to 24 weeks of Incivek, Peg, Riba and am now SVR. I feel sorry for anyone who has to treat, suffer side effects and manage their own care.